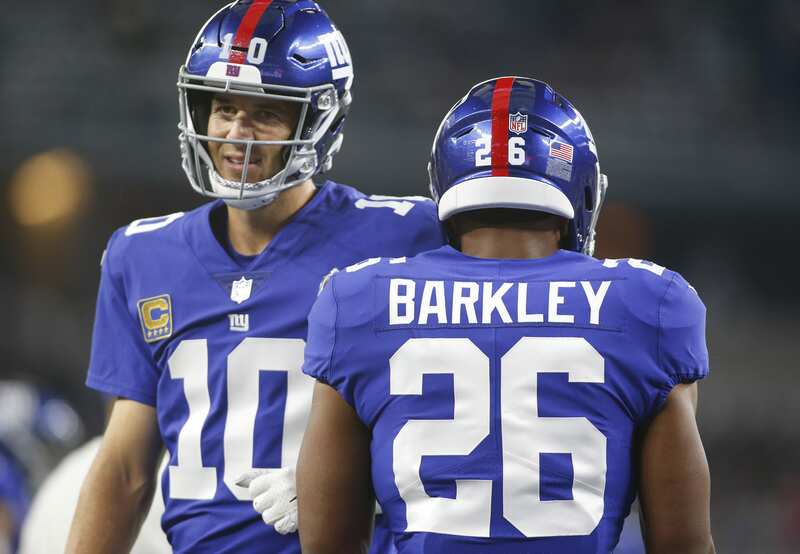 As the weekend passes and veteran quarterback, Eli Manning collects a $5 million bonus, it rules out a potential trade the New York Giants were rumored to be interested in. Arizona Cardinals passer Josh Rosen was thought to be on the trading block for a draft pick this offseason, and the Giants were one of the teams that would’ve been a perfect fit. The team could walk away with not only 2018’s top running back but a potential franchise quarterback from the same draft. But, Manning collecting the bonus money without any chances of being cut essentially takes a Rosen trade off the table -why? Because it would indicate Rosen sitting behind Manning for a season, wasting away a year off his rookie deal. Going into his third-year with only two years left on his rookie deal isn’t the right move for the Giants if they plan to build around youth and lower cap deals. Drafting a signal caller in the 2019 NFL draft makes more sense, simply because it opens up the cap for the extended future and keeps them in a good monetary state. The expected departure of Manning next season will open up $23.2 million in cap and allow general manager Dave Gettleman to appropriate resources towards the defense and secondary. The offense seems to be in good shape after acquiring lineman Kevin Zeitler and slot receiver Golden Tate. I expect the Giants’ offense to operate within the boundaries – running the ball with force and utilizing unique routes to confuse defenses. Having Saquon Barkley forces opposing defenses to stack the box and play closer to the line of scrimmage, which will allow the quarterback to make pre-snap reads more efficiently and take advantage of man coverage. Drafting a player like Kyler Murray would open up an entirely different dynamic, something we’ve never seen before on the Giants. Enabling the read-option with a quarterback that has more speed and better touch than Lamar Jackson could be the recipe for success. The Giants could also take a more traditional route with Dwayne Haskins – pocket passer option with more patience and ability within the pocket. If only it was as easy as just being able to take a player and “mold them exactly to their fit” . IMO …it’s a faulty premise. They should take Rosen IF they feel he is the best player option they have and they decide to address QB ..You also have to factor in getting to address 2 other positions with first round picks and how that strengthens your roster. Having Rosen sit for 1/2 to a full season is not off the table. If he gets traded anywhere, he will need to learn a new offense. Ideally (according to the KC model as we are calling it), you want to have a younger QB come in and learn behind a vet; this would only be 1 year later. They can easily extend him next year if things work out. The whole idea of clearing cap space IS to be able to sign or re-sign / extend whomever they want next year. I think maybe you are missing the point as you pointed out above. 1 less year on a rookie deal is certainly not a deal killer. What some are missing is that Shepard is an UFA next year. The just signed another slot WR in Tate… a lot cheaper than what Shepard will want next year. Do the Giants package Shepard and say the 3rd pick for Rosen? They also just resigned Lattimore whom they liked before injury. Things seem to me that Shepard is on the block… the last remaining of the Miami boat gang. Ahh I see what you’re taking about, just seeing this comment now. It’s a good thought, makes sense one year before his inevitable departure. You’re also missing the point of getting a future franchise QB for potentially only a 2nd round pick. And with the AZ Cardinals having already paid his bonus, this only makes it all the more attractive financially. Also it’s Patrick Mahomes, not Patrick Mahoney. Dave Gettleman said they wanted to follow the Kansas model. Did you think Manning wasn’t going to begin the season as the starter? You’re wrong. The Cardinals ate Rosen’s rookie bonus, it’s still a great rookie contract to absorb for his remaining contract period. Any rookie or Rosen is going to sit behind Manning. Remember the Giants want to follow the KC model. Who says the giants want to follow the KC model? It’s absurd that ppl think just by following that model you can guarantee success. We are comparing oranges to apples with Rosen and Patrick Mahoney. You missed the point, Alexander. It’s an incorrect assumption to think that the Giants would automatically start Rosen with back-ups. In fact, there was no scenerio that Eli would be cut this year as you need a “bridge year” to transition. The Giants would be wise to dive for Rosen as he is that good and have Eli work with him this year. How? You build teams on rookie deals, especially that of a QB. Why take Rosen when they can go out and grab Murray or Haskins and mold them exactly to their fit instead of having to re-shape Rosen who just took a massive beating on his rookie year. That logically doesn’t make sense, and your argument doesn’t address those points at all.